Over the past 3 years, the New Zealand Philippines Business Council (NZPBC) has been running a series of seminars, dubbed as ‘NegoShow’, to help aspiring entrepreneurs on their business ventures. 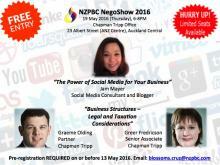 This year, NZPBC held its 4th NegoShow on 19 May 2016, from 6-8PM, at the Chapman Tripp office, ANZ Centre, 23 Albert Street, Auckland City. The event was open to members and non-members free-of-charge. You Are Invited to NegoShow 2016! 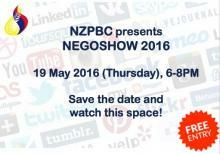 We would like to invite everyone to this year's NegoShow on 19 May 2016 (Thursday), 6-8PM, at the Chapman Tripp Office, 23 Albert Street (ANZ Centre), Auckland Central. With highly-esteemed guest speakers on the fields of social media, business taxation, and corporate law, this event would definitely sell out quickly! NegoShow 2016 is a FREE EVENT with LIMITED SEATS AVAILABLE, so pre-registration is required on or before 13 May 2016 (or once we reach the maximum capacity, whichever comes first). Read more about You Are Invited to NegoShow 2016!